Had a light morning at work so I decided to fish the front coming in at my local ponds. Got my girls all off to school, let my lovely bride sleep in and took off after the bus had left. I fished my usual spot but ran into some wicked wind. I was fishing a small ned on my spinning rod but missed 2 bites due to the bow in my line. I finally connected on a hard bite and landed first bass of the morning. After that it was all fly rod for me. I popped 3 more bass on a grey and white clouser that some stranger had dropped off in my mail box. I tell you what it was the magic ticket on a fast strip. The wind pushed me up to a different pond with a bit more of a break. Then fishing really got fun. First was a bass, then a Gill, then I started in on the crappie. Never switched flies and the clouser just whacked them on just about every 2 or 3 casts. Truly grateful for them showing up in the mail yesterday! All my ugly casting, short rods, and other imperfections are all hidden in the darkness! Thankfully I can catch em in the daylight too. Very nice! Creature of the night here myself. So peaceful out there in the dark. I knew I should of met ya at home for dinner... Lol Still jelly of the fish time you got in! Great trip report. Love reading these posts JD! Thank you for sharing, we have a few hives around here at work, and I am starting to learn more about the keeping process. Very cool! That's called getting it done! Beautiful fish there, congrats guys that's very impressive. That's an awesome weekend there man! Those are some very impressive numbers throwing sticks. No competition there lol you put a hurting on some nice ones. The bite sure was impressive wasn't it. I told Seth that under different circumstances if we weren't trying to go for huge numbers we'd likely of been up there with ya doing the exact same thing. Great times indeed. You'll have to fish the tourney with us next year. It's for a great cause, and ya can't beat the meal after either! Looking forward to the next time we can fish together my friend! So kind of a formal recap here. I must say this was the best weekend for me out of a boat on Taney ever. Fish we're hungry and we had a consistent bite pretty much all up and down the lake FOR 3 WHOLE DAYS! Trophy area fished well, albeit a bit slower down around the boat ramp. The sections after the trophy run and the clay banks both fished really well. Eddy fishing was on fire. Not just in trophy area but a little further down lake as well. Above and below the narrows also produced, heck pretty much anywhere there were eddys and structure you could find a bite or two. We doubled up 8 times I think when we'd find them? You'll lose some jigs in structure, but if you're not getting in there or down there you weren't catching em. I will say we caught a ton of smallish fish. We also we're targeting schools of fish for the tournament since you need numbers to get the length total up there. We'd find a school of dinks and just sit there and sore lip as many as we could. One small stretch I think we motored and drifted back about 5 times just in one small stretch but almost every cast we were getting bites. The upside to the above is that we also caught some really solid healthy bows and browns once you weeded past the schools of small stockers. The fish were healthy and had some really good fighters and colored up beautifully. I had a brown follow on my jerk bait that was a monster, and we had several other follows by some solid fish including one that followed a small 11in rainbow all the way to the boat and was ready to take a swipe at him till I pulled him up. 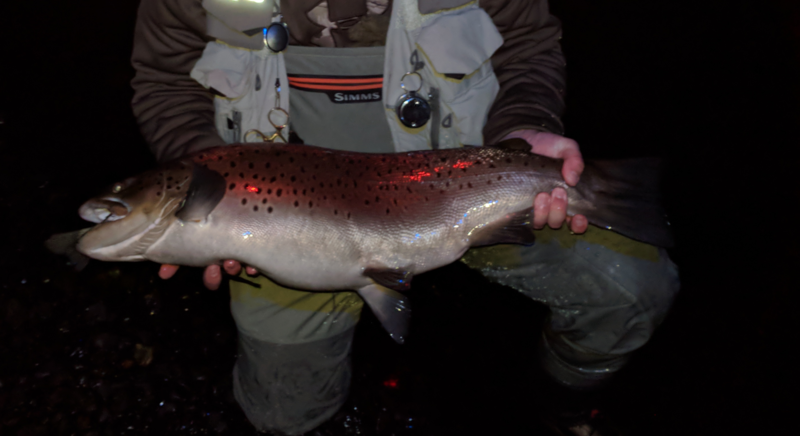 Wish I would of let him take that one in hind sight... Night fishing was kind of a bust for me, but honestly with the amount of fishing we did and the numbers we caught it didn't bother me much. I need more practice fishing out of a boat, and had a great teacher who I got to watch put on a clinic Saturday when it comes to deep slow jigging. We fished white, but I think for me personally the darker jigs caught more fish for me anyways. I fished a tri olive zig jig quite a bit, and also a 3/32 grey on grey which put up some great numbers. I literally fished that jig till it fell apart... You needed 2 rods as well one with 1/8oz for the fast deep stuff and then 3/32oz for hitting the Eddies. Speaking of rods I did pick up a 6ft rod instead of my normal 4.5ft buggy whips. The extra length for sure helps out of a boat, and I got to break her in on a nice brownie Sunday. Appreciated having a bigger rod for that fish. Equipment wise I also found another great piece of gear in a pair of Huk fingerless gloves. My wife is always on me for good reason about sun protection and she bought me a pair of these. Not only did the tops of my hands not get burned, but they are fantastic for handling fish when you have to. I use the jig pop method when I can, but sometimes you have to get a hand on them to get them released. With the textured grip on these gloves you only have to grip them once, and you avoid when they go squirting through your hand and you are constantly trying to get a better hold on them. From a fish health perspective with trout I will be wearing these pretty much everytime from here on out. Really helps with conserving the slime coat when you do have to get ahold of them. Great turn out for tournament, great company, lots of laughs, and some fantastic stories. We lucked out and got a last minute room at Phil's and as usual just my favorite place to stay. Just overall a stellar weekend of friends and fishing that will be hard to beat on the fishing side of things! I have to thank @Seth for being my trusty Captain and guide! He's a good net man as well! Plus he's got a wicked boat that just fishes great! It sure is! Tips my hat to @duckydoty Biggest fish in it so far. Although I have it setup for wade fishing it really is a great boat net too.